I got this case for storing my small Nikon 1 series lenses. It's perfect for traveling while securely holding and protecting the lenses without the need for a lense pouch and bag. Nikon charges over $20 each for their thin lense pouches and then you need a camera bag to carry them. Even then it wouldn't hold the lenses as securely as the internal Pick N Pluck foam..not to mention this case is airtight so it keeps out moisture and dust very well. I bought another one of these to house my Nikon 1 J5 camera and a couple of small lenses. Currently my "lense only" Pelican 1120 fits a 10-100mm VR zoom, 10mm f2.8, and 10-30mm PD zoom with room leftover for another small lense. If you want to house the camera with a couple of small lenses it would fit too. For example the 10-100mm zoom fits along with another lense attached to the camera with room leftover for accessories like battery or charger. 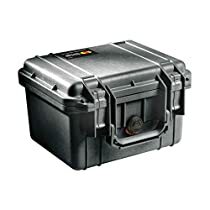 I've heard excellent things about Pelican cases and decided to give it a shot for putting some medical supplies in it. I had no idea the foam was already pre-cut, so for whatever size you're wanting to put in it the size can be created with ease. Took me about 5 minutes to complete 3 different size sections within the foam/ case. This is a very nice case. Light, rugged, well-crafted, and water-tight. I'm using the case to hold the battery and excess cabling for a fishfinder mounted on a kayak. The customizable foam is a nice addition. My opinion is that it's reasonably priced for the level of quality. I personally haven't seen a case that's really as well made for less money. 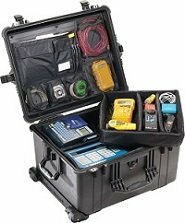 Protect your camera and other electronics with the Pelican 1120 case. Pelican cases are made with copolymer polypropylene using an open-cell core and solid-wall construction. As a result, the case is stronger and lighter than the competition. The case's strong build makes it waterproof, crushproof, and dustproof, helping keep your camera equipment safe in any situation. The case also boasts stainless-steel pins for the hinges and handles, along with easy-to-open double-throw latches. Other features include an automatic pressure equalization valve, which releases built-up air pressure while keeping water out; a customizable Pick 'n' Pluck foam interior; and stainless-steel reinforced padlock protectors. The 1120's interior measures 7.25 by 3.06 by 4.75 inches (W x H x D). Custom engraved nameplates are available for a nominal fee. Stainless steel ball bearing wheels last longer and ride smoother. The nylon hub adjacent to the stainless steel is made to resist heat. The result is less wear and tear on the polyurethane wheel. © Buybestcameras.com All rights Reserved.